If you're still not convinced how successful our stainless steel restoration process works, read through some comments from satisfied customers. Don't Replace It... RESTORE IT! There was bad damage to the front doors of our fridge. We submitted our query through the Stainless Restorations website. Lee came back to us promptly and explained to us with all the options how we should deal with the repairs. Lee has given us his valuable opinions based on his knowledge and expertise from many years. We find Lee deals with his clients in a very honest manner and he always puts clients’ interest first. We will definitely use Stainless Restorations in the future and we would like to recommend Stainless Restorations to all. I contacted Lee from Stainless Restorations after I'd left a bleach cleaning product in my stainless steel laundry basin. It left the basis severely stained and I thought I'd probably have to replace it. On speaking with Lee he assured me that he could have it looking like new. I am absolutely thrilled with the results with my basin now looking brand new. Lee was absolutely fantastic - fitting my job in when he was already fully booked and then also fixing my bathroom vanity while he was here by removing some heavy watermarks. I would recommend Lee to anyone who wants to repair rather than replace as the results are stunning. 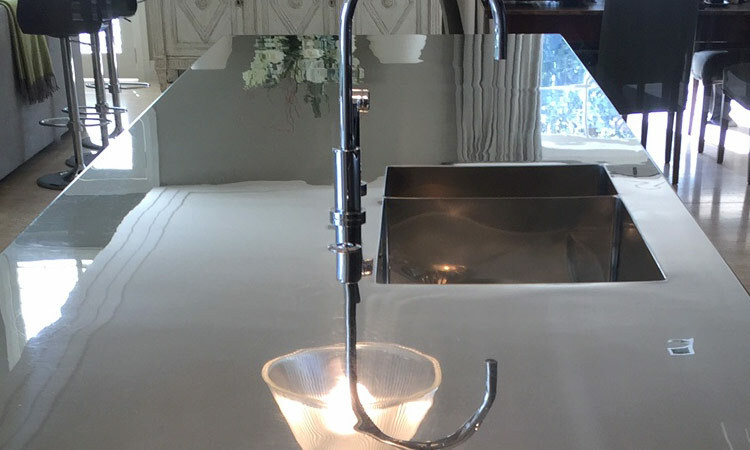 Today was the 'big reveal' of my sink bowls and I was very impressed by how magnificently they shone... They have never before looked so good and I really don't want to use them again! Thanks again for a great outcome. My apartment in Snells Beach has stainless steel counters and were in extremely poor condition. My 1st consideration was replacing them with laminate or granite but decided to look for someone who might refinish the tops. I was pleased with my initial phone conversation with Lee and felt comfortable with asking him to do the job. The results are 'night & day'!!! The counters look brand new and other owners in the building thought they were new counters!! Lee is extremely keen on perfection and I believe with my counters the end result is perfection! I have already recommended Lee's services to others and would not hesitate to continue to do so. Stainless Restorations have been a consistent and reliable contractor to Metlifecare in the Auckland and Bay of Plenty regions for my 3.5 years with the company and before. Their work is carried out on time and constantly ahead of schedule to an outstanding level of quality. I cannot recommend them highly enough. We have been using Stainless Restorations services for several years restoring kitchen sinks and laundry tubs as part of the refurbishment of our residences as they become vacated. Lee does a great job – they come up as new, as he advertises. In addition, he is a most pleasant chap and always comes to do the job when he says he will. Lee and the team at Stainless Restorations, The copper brewing vessels look superb – I really appreciate the efforts that you guys put into them – it’s a bugger of a job!! Feel free to use the photos on your website. Stainless Restorations restored our urinals and hand-basins during a refurbishment project. Many thanks – a great job, what a difference! I had Stainless Restorations restore our large linen finish bench top in our home prior to sale. Prompt professional service – looks like new, great job! The Sawyers Arms Hotel underwent major renovations in 2010. Mike from Stainless Restorations worked miracles on our old stainless sinks and not to mention the old urinal which we thought we would have to replace with a new and very expensive one. Mike saved us thousands of dollars throughout our renovations by saving many old stainless items and restoring them to their original sparkling state. We would recommend Mike for any Stainless Restoration you may have or have been thinking about doing.